BP announced Monday that a leak from one of its North Slope production wells was stopped at 3:35 am. State regulators don’t yet have an estimate for how much oil and gas was released from the well. The cause of the incident also is still unknown. The well was spewing both gas and crude oil when BP first noticed the leak on Friday morning. State and federal regulators reported the well stopped spraying oil on Saturday after a safety valve was activated. The well continued venting natural gas until it was killed Monday morning by pumping salt water down the hole. BP is currently maintaining the water pressure until it can use a mechanical plug to secure the well. It’s not yet known when that plug can be installed. The initial response took place during challenging weather conditions, according to Suzanne Skadowski, the U.S. Environmental Protection Agency’s public information officer for the incident. “It has continued to be very cold, and there have been pretty significant winds. Twenty to 30 miles per hour, upwards of 40 and 50 miles an hour,” Skadowski said. But Skadowski said the main challenge was the well itself. Two separate leaks had formed and the well had risen three to four feet out of the ground. This caused a pressure gauge to break off, which hindered efforts to kill the well. BP employees were forced to leave the pad during the incident and no injuries were reported. 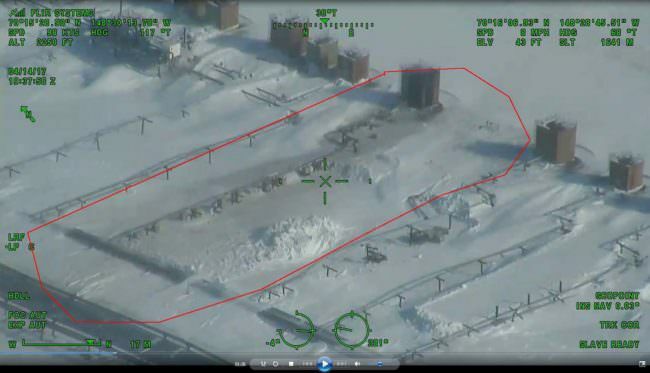 Regulators are investigating the leak’s impact on the environment, but an initial overflight indicated the crude spray didn’t reach the nearby tundra. Alaska Oil and Gas Conservation Commission Chair Cathy Foerster said her agency will observe the leak investigation, but there’s not yet any evidence that BP did something wrong. “We have no reason to believe that BP did anything that was regulatorily non-compliant. We have no reason to believe that human error was involved. We just don’t know,” Foerster said. Foerster said at the time of the incident, the well was producing about 300 barrels of oil and 30 million cubic feet of gas per day. The well is located about five miles from the Deadhorse airport, and the nearest community, Nuiqsut, is approximately 50 miles west of the pad.